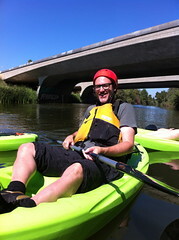 Last weekend we got up at 6am on a Sunday to go kayaking on the LA River. 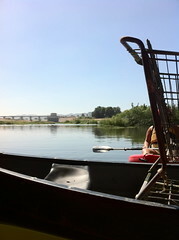 I am a big advocate for urban access to water so I was excited about this trip and getting out on the river for a few hours. 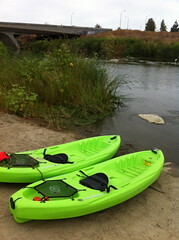 In 2010, the EPA ruled that the the LA River is a navigable waterway. This is a huge deal in that the Clean Water Act only applies to navigable waterways. 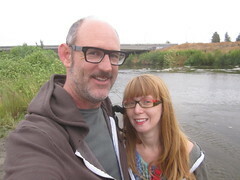 With this ruling the LA River gained a number of environmental protections. 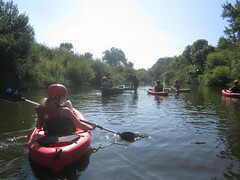 It also opens the door for the LA River to be used more recreationally, allowing it to function more as a Central Park for the city of Los Angeles. 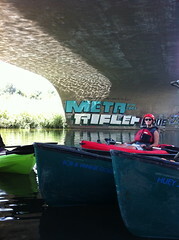 So this is only the second season that LA River Expedition has been able to to take groups out on the LA River. We wanted to go on a trip last year but they sold out in 10 minutes and we missed it. The Army Corp only allows them to run the tours 10 weeks out of the year, due to flood safety concerns. 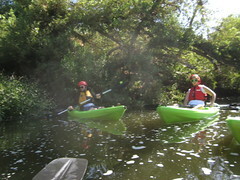 This year they added a lot more trips so more people could get out on the river. 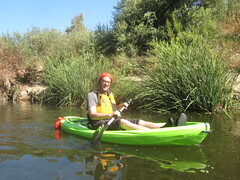 Our group traveled a section of the river in the San Fernando valley west of the Sepulveda Basin near where the 101 and the 405 freeways meet. We launched just north/west of the dam and headed upstream for a 3 hour trip. This section of the river is pretty naturalized. 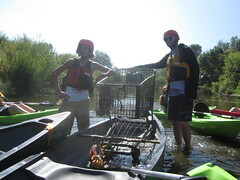 Surprisingly, there wasn’t that much trash, but we did see maybe 30+ old shopping carts in the river. 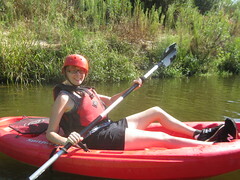 Sometimes the kayaks would get stuck on them if they were submerged. 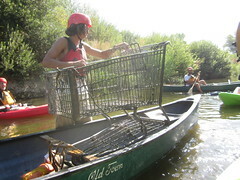 Our group pulled one shopping cart out of the river and transported it ashore on a canoe. 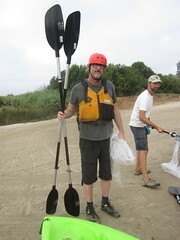 I also collected some golf balls and trash from the river. 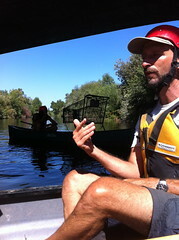 They are trying to get permission to take people out on the Glendale Narrows section of the river next year. The Glendale Narrows is a section of the river I know well and it is near where we live. 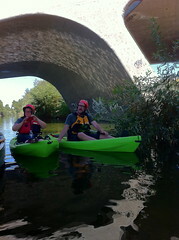 Plus this section of the river has some great rapids so that should make the kayaking extra exciting.